The person next door spends an average of $125 a month. On average, Rhode Islanders are paying $1,803 every month on homeownership costs. There are half a million homes in Little Rhody, 67% of which are occupied by owners. Rhode Island is one of the top 5 U.S. States that are at risk of natural hazards. Hurricanes are commonplace in the state, causing terrible flood and storms. Rhode Island’s closeness to the coastline makes it susceptible to devastating natural calamities. Rhode Island also witnesses dangerous blizzards. No wonder, Rhode Island shows staggering home insurance rates. Another reason that contribute to higher insurance premiums is increased presence of older homes in Little Rhody. According to data from the U.S. Census, the rate of owner-occupied housing units in RI is 67 percent and a good lot of them are aging properties. However, despite the high average insurance rates, it’s always suggested to get a comparison study on different insurance companies before finally signing up. It’s likely that RI homeowners may pay higher than average home insurance premiums, which is why it’s key to do a comparison study of multiple insurers to find the most competitive rates suitable for your needs and your home. Try our hassle-free comparison tool to get you started. We'll give you a list of insurers in your area, so you can find the best deals around. To learn more about premiums in RI and the most popular home insurance providers in-state, check out the article below. Insurance Information Institute (III) has ranked Rhode Island the 7th most expensive state in the U.S. in 2016 (latest available data) with regards to homeowners insurance. The annual average home insurance rate in RI is $1,496, which is quite higher in comparison to the national average of $1,192. When it comes to the monthly premiums, Rhode Island homeowners pay $125 per month on an average, while the national monthly average is $99. It would be only smarter for you to check the reviews of top home insurance companies in Little Rhody which will help you to pinpoint the most compatible company for you. We arrived at our best homeowners RI insurance companies through reviewing homeowners insurance reviews and customer satisfaction. A company must display financial strength in order to be deemed trustworthy to be able to pay claims when time comes. First and foremost, a company’s customer service rankings is looked at and also its financial stability. The various discounts rates and variety of coverage that customers can choose from are also considered. The following are our top homeowners insurance companies in RI based on their market share holdings in the state. Please note that another company that we do not mention may be best suited for you. These three companies are meant to serve as a guide for you, in your search for finding the best rates around. Amica is one of the topmost homeowners insurance companies in RI, commanding almost 16 percent market share in homeowners insurance premiums in the sate. The company has been ranked the highest by JD Power which definitely testifies to the solid credibility assured by the company. Amica is one of the rare gems to bag 5 (Among the best) out of 5 Power Circle Rating from JD Power from their 2018 U.S. Homeowners Insurance Study that looked very closely at consumer satisfaction. It has also received the highest A++ (Superior) rating from AM Best. The company guarantees solid financial footing and powerful claim resolution. A standard homeowners insurance policy from Amica offers coverage for the residential unit, additional structures (if any) on the unit, temporary repairs needed to hinder damage in the future and liability protection. The policy also covers the expenses that you incur when you are unable to reside in home post a catastrophic loss. However, Amica premiums come with comparatively higher price points than many other insurance companies around. But the good part is that there are various ways to cut down on the insurance rates here. Amica offers discounts on several grounds like bundling of policies, auto payment and installation of security devices in home. There are also discounts for home remodeling which is especially great if you are staying in an old home. A unique aspect about Amica is its dividend policy for consumers. The company extends a handy dividend amount (5-20%) by the conclusion of term, based on its financial success in that particular term. Allstate occupies almost 13 percent market share in the Rhode Island homeowners insurance sector. The company is widely popular for its versatile discount facilities, easy policy options and superior educational resources and tools. It’s to note here, Allstate has got some of the most affordable rates compared to many other insurance companies in the beautiful Ocean State. Customers can enjoy further savings with the help of its vast discount opportunities. There are as many as 14 types of discounts for Allstate customers. You will get rebates for staying claim-free, auto-billing, bundling policies as well as by installing security devices in home. The company is also bustling with some unique discount provisions such as welcome discount, rebate for seniors as well as early sign-up discount. If you are confident about the safety of your home, you can sign up with Allstate’s Claim-Free Rewards feature that will reward you with a bonus check if you can pass a year without claims. In regards to financial stability, Allstate enjoys a solid reputation. No wonder, AM Best has rewarded it with an A+ (Superior) and it has got an AA rating from S&P. It has also received a 3 (About average) Power Circle Rating on overall customer satisfaction from JD Power. The Allstate website is user-friendly and features lots of videos, articles and tools to guide customers in making the best of their homeowners insurance policy. Alongside, these educational resources also contain contents on homeownership. A unique feature of the website is its in-built Premium Gauge section. It enables one to check the impact level on his premium rate based on varied factors. The company has also come up with its Digital Locker where you can store the list of your entire home inventory. Liberty Mutual occupies 8.6 percent share in the Rhode Island homeowners insurance market. The company is especially known for its affordable pricing, versatile range of endorsements as well as multiple discounts. The company extends as many as 12 discount options which is more, compared to many of its competitors. You will get discounts on bundling multiple policies, staying claim-free, remodeling your home and so on. The company helps new homeowners by offering discounts for newly built homes. You will enjoy good savings here if you are ready to insure your property to 100 percent of replacement cost. Moreover, there are special benefits and deductions for the Rhode Island homeowners who holds membership with one of the affiliate associations and organizations of the company. It’s to note here Liberty Mutual assures a hassle-free claim reporting facility. There are various ways to reach out to the company, including its 24/7 claims hotline, online chat, mobile app and physical visit to a local agent’s office. The company has earned an A (Excellent) rating from AM Best. It has received 3 (About average) out of 5 Power Circle Rating from JD Power for overall consumer satisfaction. Rhode Island Housing (RIHousing) has recently started a new loan assistance program called "RI-Refi" program, which is geared to help homeowners who are “underwater” or owe more than what their home is valued at the current market. Homeowners who qualify can get up to $75,000 to help with the amount owed on any first or second mortgage(s) with a forgiveness period of three years. The RI-Refi programs enables homeowners with negative equity to receive up to $75,000 to decrease their balance owed on their mortgage(s) and refinance into a 30 year RI Housing loan, with a fixed rated based on the current market value of the home. The loan is for one to four family homes and eligible condos with a max limit of $424,100 loan. The RI-Refi helps eligible homeowners a lot by helping erase their negative equity and lowering monthly payments by refinancing. Funded by the U.S. Department of Treasury’s Hardest Hit Fund program, the homeowner’s total household income must be less than $87,360 (for a one - two person household) or $101,920 (for three or more person household) annually to qualify for the RI-Refi program. For more details, please contact RIHousing at (401) 450-1321. Owning a home is a big step in life and as such, it's equally important to protect your investment. As a homeowner, the best way to protect yourself from incurring any losses is by purchasing a homeowners insurance policy from a reputable provider. However, obtaining a homeowners policy that provides sufficient coverage at an affordable price is never easy depending on which part of the country you come from. If you live in Rhode Island, then you are in luck. 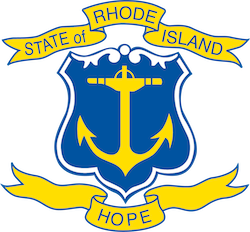 RI, nicknamed the Ocean State from its access to the expansive Atlantic Ocean, is the smallest state in the U.S. There are a lot of options for homeowners looking to buy coverage in the Ocean State, ranging from local to nationally renowned homeowners insurance providers. There is no legal requirement for homeowners to purchase insurance for their homes in Rhode Island. The average cost of homeowners insurance in Rhode Island is $1,496, data from III show. Compared to the national average which stands at $1,192, the cost of Rhode Island homeowners Insurance is relatively high — 7th highest in the nation as of 2016 (latest available data). Insurance providers consider several factors when determining the cost of insurance including your claims history, credit report, discounts applied to the premium, deductible, amount of coverage, and the type of construction. Due to its close proximity to the Atlantic, the Ocean State has several large bays and inlets. Residents of Rhode Island should consider purchasing flood insurance coverage to protect themselves from losses that may occur from flood-related disasters. Typically, a standard homeowners insurance plan does not cover flood damage. Seek advice from your agent before you purchase flood insurance. Owning a home has is its perks, but if you are not careful, the costs that come with it can easily drown you. Besides having to pay for utilities such as gas and electricity, you have to keep up with the mortgage payments or the bank will foreclose your home. But there is good news, your homeowner's insurance costs don't have to be super high. The cost of Rhode Island home insurance can vary greatly from one insurance provider to the next, with changes amounting to hundreds of dollars. The best way to ensure that you get the best prices is to shop around. Also, ask for discounts and make sure that you bundle your homeowners and auto insurance policies for simple ways to save money.